There are applications where a customer needs a heavy duty truck, one that will last for years, that is durable and reliable but they really don’t need the power of an 11 liter engine. There are locations where the terrain is flat so even at class 8 loads you really don’t need a lot of horsepower to get the job done. Some applications can use a lighter duty truck, one that is right sized, a little lighter in weight and therefore you wouldn’t want to spend the money on a full class 8 truck. A company that already owns Granites might find themselves in need of a lighter duty truck for certain applications. Adding a Granite MHD allows them to service the truck with many of the same parts and at the same dealer. The Granite MHD has found work as small municipal snow plows, local delivery fuel trucks, rear-loader refuse collection, batch concrete trucks, concrete mixers and even concrete boom trucks. It is a versatile model and its backbone is that of the Granite so you know it’s tough. The Granite MHD is a misunderstood model. It is a niche model that only a few salesmen and customers understand and a lot of people really don’t. 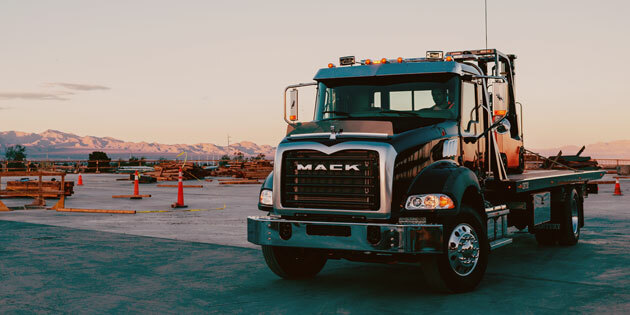 Let me step back and start by defining how we at Mack define MHD: A Medium Heavy Duty model really straddles the line between a class 7 and a class 8 vehicle. A brief, basic description might be, a class 8 truck used for lighter duty work, with components that lighten it, lower the cost and an engine size less than 10 liters. I guess I should start off with what a class 7 and class 8 truck is. The classes I am referring to are the Gross vehicle weight ratings (GVWR). Class 7 vehicles have a GVWR of 26,001 to 33,000 pounds and class 8 have GVWR over 33,000 pounds, any truck rated over 26,000 pounds requires a commercial driver’s license. Typically an MHD truck falls into the class 7 weight ratings or the lower end of the class 8 ratings. With single drive axles starting around 21,000 pounds or tandem drive axles not exceeding 46,000 lbs. There are many medium duty trucks that are built up from a class 5 or 6 model to reach the axle ratings required to be class 7 and 8 then are sold as a “medium heavy duty” vehicle. There are also a couple models that are class 8 vehicles equipped with lighter duty components to reduce cost and weight and compete on the upper end of the MHD category. The first category, where the medium duty truck is built up, represents the greater majority of this market. These trucks are generally lighter weight and cost less. Upon analysis of the vehicles you will find a smaller cab with lower feature content and lighter components including frame crossmembers. The latter category, the scaled down class 8, is really a big truck. If you walk around these trucks and look them over you’ll see they are still mainly heavy duty trucks with changes centered mostly around the powertrain components with possibly some aesthetic and feature reductions. In both cases the powertrain is targeted to be as small as possible and still have enough power to move a 30,000 – 60,000 pound truck. Engines around 9 liters seem to be the sweet spot and since they have a lower torque rating than the larger displacement engines, a lighter duty/weight transmissions can also be used. These models are ideal for light duty work and are a lower initial investment. Mack MHD is in the second category, the Granite model is refitted with some smaller components to position it as medium heavy duty. The strategy here and really what this means is that a durable heavy duty chassis and cab is fitted with a smaller engine and transmission, in some cases lighter frame rails, axles and suspensions. This provides a lighter weight, lower cost version of the Granite, right sized for lighter duty work. What it is not: It is not for everyone. This is a niche truck, not for people who need big power since the 9 liter engine is limited. It cannot compete on a pricing basis with the smaller medium duty vehicles being built up to a class 8 axle rating and definitely not with a straight out medium duty truck. What it is: It is a durable truck that is built to outperform and outlast smaller medium duty competitors. This kind of seems to be an obvious statement as I type it; as I’ve said it’s a Granite (with a lighter duty powertrain). In the end, for someone who needs a light duty truck and has a limited budget but is not concerned how long the truck lasts, just that the price is low and the GVWR rating is high enough, then the medium duty truck with upsized engine and axles may be what they need. If they need a light duty truck at a good price and are looking down the road for it to last 10 years or more, then spending a little more on a Mack Granite MHD is definitely worth considering.